First, let me answer your obvious questions. No, I have not gone off the deep end. No, I am not so bored as a Stay at Home Mom that I have nothing better to do than come up with fun DIY projects. Maybe, just maybe, I’ve found a new hobby in coming up with more frugal, even healthier, alternatives for products I haven’t blinked an eye at in my whole life. Now doesn’t that just sound fun? 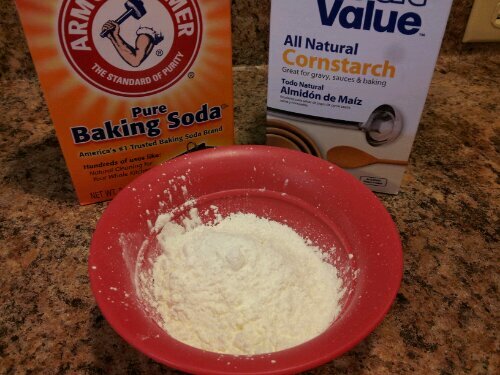 First, I mixed the baking soda and cornstarch. Then I added 6 drops of lemon essential oils. At this point, the mixture smelled like lemon meringue pie. If I liked lemon meringue pie, I might have been tempted to eat it. But I don’t, so we’re good. But that is the beauty of this! Since I used Young Living lemon oil, I could have eaten it if I wanted to! Somehow I feel better already that I’m putting something under my arms that would be safe for me to ingest. Next came the hard part. 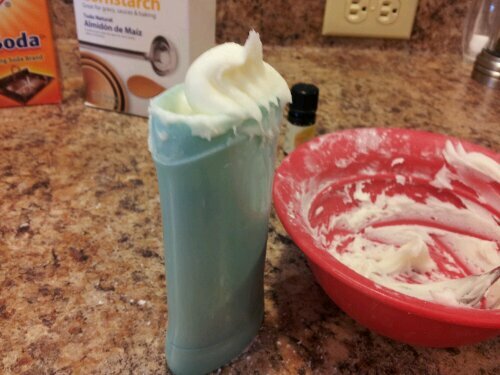 Putting it into the old deodorant tube. I tried and tried to get it in with my fork, but it seemed to be taking forever. Then I started thinking that I needed a different utensil, like a very very small spoon. Aha! Alyssa’s Baby Alive spoon was perfect! Here is what the final product looked like. 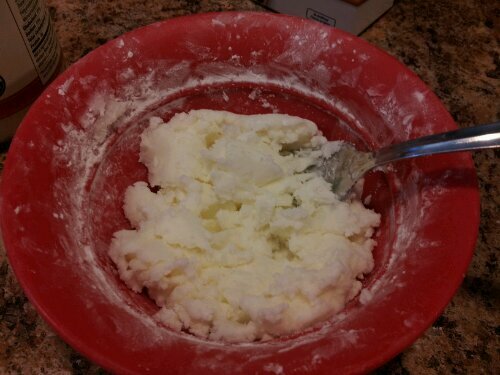 Since it had been mixed a lot, it was very soft, so I put it in the refrigerator for about 30 minutes so it would harden. 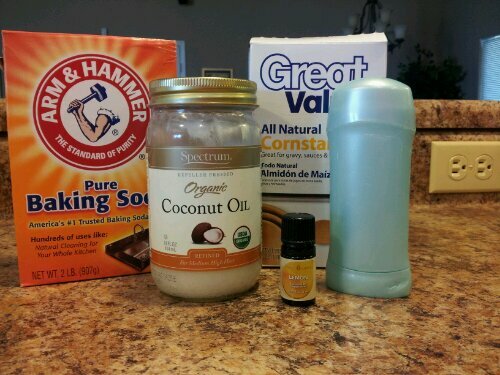 Since coconut oil melts at 76 degrees, it stayed the perfect consistency, like store-bought deodorant/antiperspirant. The next day when I tried it, I was amazed at how smoothly it went on! 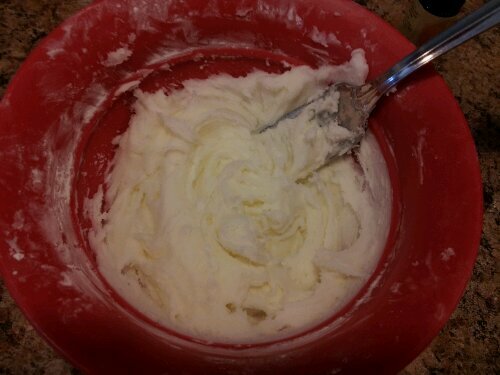 The coconut oil softened immediately upon contact so I had to rub it on pretty quickly, but otherwise it went on almost clear. About a week later I hit a snag, though. The deodorant container wouldn’t roll the DIY deodorant up. That was a real bummer and I’ve not read of this problem in any other blog so perhaps I just had a dud container. What I ended up doing was putting the closed container upside down in the shower for a few minutes. The oil melted and dripped into the top. After it hardened again, I simply scoop it up with my finger and apply from there. Not ideal, but I’ve gotten used to it. So, the big question: what were my results?? Day 1: I couldn’t tell a difference at all between my old anti-perpspirant and my new deodorant. It went on amazingly smooth and I had honestly forgotten about it until the middle of the day. In full disclosure, however, it is the middle of winter and I stayed inside all day. No sweating and no smelling. Day 2-5: It was warmer, and at times I could sense that I was sweating a little, but when I checked, I couldn’t feel it. I don’t know if it was my imagination or what. But absolutely no odor. Occasionally when I got hot, I got a small whiff of lemon-meringue pie, but it was very subtle. As the weeks passed, I was still waiting for the “detox” period I had read about where people sweat profusely after having given up their anti-perspirant. But that didn’t happen to me. Something very interesting happened, though. About a month after I started using this, I went to dotMOM in Dallas, necessitating me driving in a car with 3 other girls. I ended up packing my old antiperspirant just in case. I used it one morning and was shocked that I actually sweated MORE and smelled a little trace of odor with my old antiperspirant. I guess my body had adjusted. I don’t think I’ll ever be going back to my old antiperspirant, although we’ll see how it does in the heat of the summer. 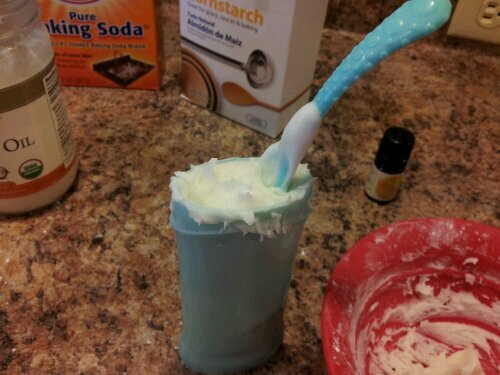 One reason, besides this being WAY cheaper (I estimated about $1 a batch, which equals a regular antiperspirant container), that I experimented with homemade deodorant, is the potential health dangers of aluminum, which is in every antiperspirant. There are potential links to Alzheimers and concerns about it contributing to breast cancer, though the latter hasn’t been proven from what I can tell. Still, here’s what it boils down to for me. Deodorant tries to counteract the bacteria on our skin to prevent odor. Antiperspirant tries to stop sweating altogether. So my thought was: God created our sweat glands for a reason. They’re not our enemy so why use something that inhibits their natural function. 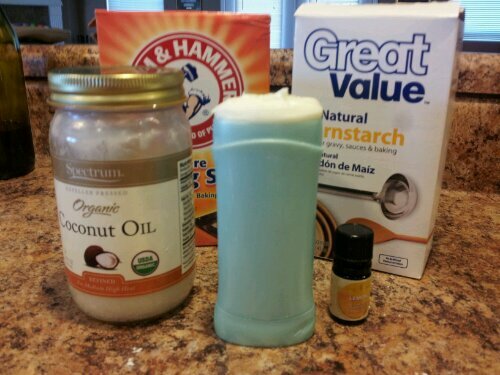 Bacteria, on the other hand, is what causes odor and needs to be dealt with, so that’s why deodorant is ideal. In my opinion. I’ve seen this recipe on a number of blogs, but here is one I found. And here are some reasons why I am concerned about aluminum in antiperspirant.